Car travel is a fact of life for most of us. Whether you commute to school, work, drive for Uber or just use a car to navigate your daily life, nearly everyone can relate to hours spent either behind the wheel or as a passenger. Another thing many people can relate to is a messy car. Maybe you go straight from work to the gym, so you’ve always got clothes crowding your backseat. Maybe you have young children who throw just as many toys as they play with. Or maybe you like to keep hiking and adventure gear in your trunk, just in case the mood strikes. Whatever the situation may be, messy cars are a common, yet frustrating phenomenon. If you are looking for quick and easy ways to clean up your mess, then look no further than the fantastic car organizers listed below. There are solutions for trunk, backseat, and driver/passenger clutter. Invest in one of these systems and never suffer a messy car again. This storage solution can be stored as a flat and compact little square. But it can also be partially or fully expanded to make a storage bin that is either one foot or two feet long. It features various compartments and pockets so that you can keep your smaller and larger items separate and organized. These awesome car organizers feature heavy-duty material and a waterproof bottom. If you are always riffling through your trunk looking for your items, then consider investing in this expandable carrier that will keep them all organized. If you are looking for something with fewer frills, this expandable trunk organizer is a good solution for you. It consists of just three large sections and two small mesh pockets. This is a great way to keep all of your things in place without having to rifle through a bunch of small pockets. With this organizer, everything is clear and visible, making your items easier to find. This a great solution for anyone who doesn’t want things rolling around in their trunk. 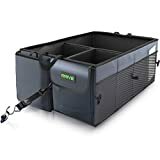 If you ride rough or are just particularly worried about items moving around in your trunk, then this organizer big with straps that can hook around a carseat or the inside of your trunk is a great solution for you. Your items are nearly guaranteed to stay still and upright, which makes this a great solution for anyone transporting messier items like groceries. This organizer consists of several large pockets and a few smaller, more secure pockets. 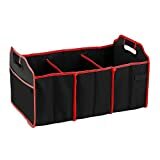 This is definitely one of the top choice car organizers that are budget-friendly and will help you to stay neat and organized. 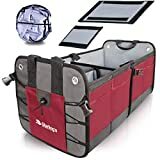 This backseat organizer is advertised for use with children’s items, but it certainly does not need to be limited to that. The organizer itself hooks around the headrest of either the driver or passenger’s seat. It hangs down the back of the seat so that anyone in the back can easily store and access various items. 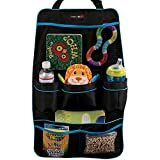 If you do use this organizer for children, you can store snacks, toys, a water bottle, and small books. If you are not using it for children, you can easily store an umbrella, water, snacks, and important paperwork like insurance and registration papers. This is one of our favorite car organizers because of its versatility. This over the seat organizer is both classy and convenient. It is made of a faux leather and comes in a rich brown color. It is capable of holding two smartphones, two water bottles, an umbrella, several papers or magazines, and an iPad or tablet with the screen facing out so that the passenger in the backseat may use it hands-free. This is one of the best car organizers for anyone with an attractive car interior. It will fit in with lux décor and will help you to keep the things that everyone needs when they travel by car (like water, paperwork, and occasionally, an umbrella) organized and easy to access. 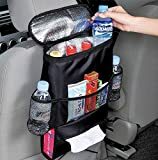 If you are embarking on a lengthy road trip or just enjoy cool beverages or the occasional snack when you drive, then this backseat organizer, which contains a mini cooler, is a fantastic solution for you. You can easily keep four bottled drinks cool, and store various snacks and backup water bottles on the outside of the cooler. There is even a sleeve at the bottom to store tissues or dispensable napkins. This is a great solution for anyone who is planning on spending hours in the car and doesn’t want to stop to refuel with food and drink. It’s also good if you’re planning a road trip with a group of people. If you always find yourself throwing your small items in your cup holder, this organizer can help you to keep everything in place by expanding that cup holder. It has three deep pockets that will protect your phone, charging cords, sunglasses, coins, pens, and more. Now you can keep everything you need easily at hand and well organized. If you aren’t a fan of the soft-sided cup holder organizer, try this one. It is made of hard plastic and turns your cup holder into a shelf with small and medium sectioned off compartments. You can still fit a cup, but now you can also store a cell phone, pen, chapstick, glasses, and coins/cash. This is a great solution for anyone looking to keep any and every item you might need while driving close at hand and easy to reach. When you are driving, the most important item to have easily accessible and close at hand is your smartphone. Your smartphone can be an entertainment system, GPS, traffic alert system, and so much more. 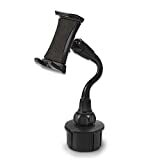 This cup holder organizer keeps your favorite device secure, easy to reach, and close to the steering wheel. This is a great item to own if the only thing you are worried about when you travel is your smartphone. If you’re looking for more information on car-related gear, be sure to check out our choices of cell phone holders and pet travel carriers.